Once my pregnant mind fixates on something, the craving must be satisfied. 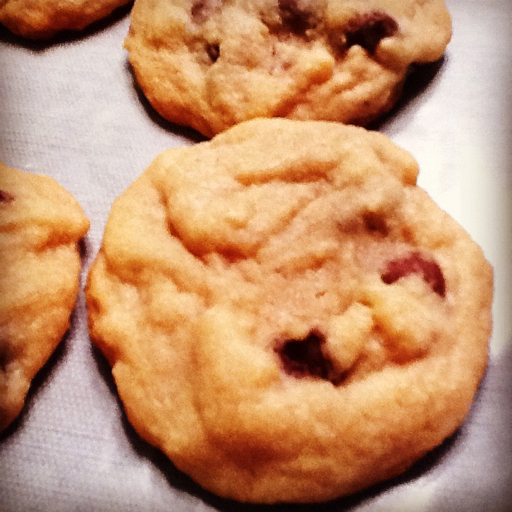 Here is the recipe I use to make the best chocolate chip cookies in the world. 2. In your mixer, cream the butter and the sugar until light. Add in the egg and vanilla and blend well. 3. In a separate bowl, sift together all dry ingredients. 4. Slowly incorporate the dry ingredients with the butter and sugar mixture. When blended well, mix in the chocolate chips. 5. Let cool, on the sheet, for five minutes. Remove from baking sheet and let cool completely. I've found that this recipe makes just over 2 dozen cookies (I have a tendency to make medium/large sized cookies and eat some dough). Double the recipe if you need more cookies. I give you permission to forget that there would be 3 sticks of butter in a doubled recipe - you don't eat cookies for the nutritional value, am I right?